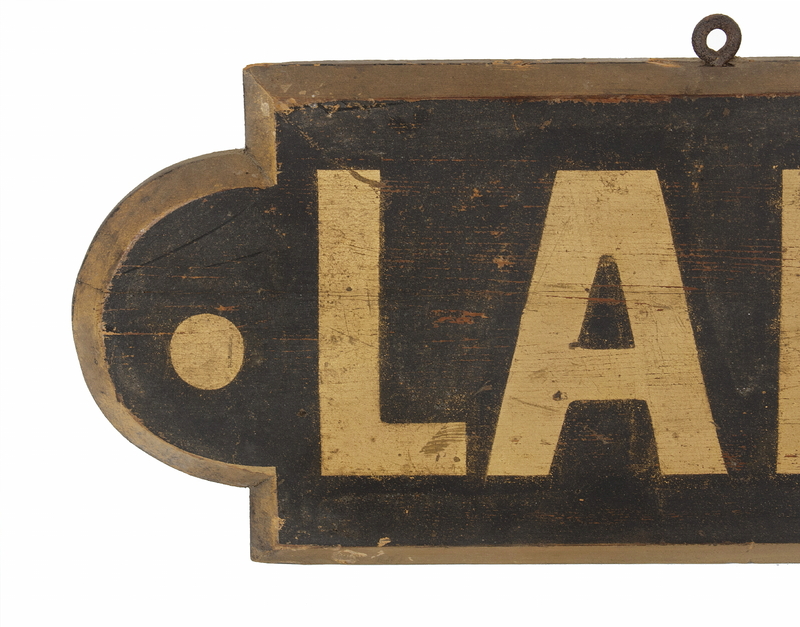 Jeff Bridgman Antique Flags and Painted Furniture - PAINTED & GILDED SIGN, CA 1880-1920: "LADIES ENTRANCE"
Dimensions (inches): 8" x 60" x 1"
Painted and gilded American sign from the 1880-1920 era with elongated format and nicely scalloped ends. Perhaps from a men's club; these usually had a separate entrance for women with a lounge and powder rooms. Language from another era with both educational and fun possible applications today. Nice for a women's suffrage collector, illustrating the social implications of another era. Humorous for either a bachelor or the strong-minded woman who rules the roost. Condition: Restoration to the gold color along the bottom edge. Otherwise original paint.